The recent J&J hip implant controversy compels the authority to step in and protect patients. Beginning from something as simple as bandages, thermometers, stethoscopes, disposable gloves to advanced devices such as computers with software that assists in conducting medical tests, implants and prostheses, medical devices have an impressive arc of development across the world. There are approximately 1.5 million different devices. Each country defines these categories in different ways. However, typically, they are classified based on risk levels to patients. Higher risk devices usually require stricter control by regulatory authorities to ensure safe use and performance effectiveness. If regulation is all about keeping control of the risk levels to patients, Indian patients got a glimpse of what can happen when you don’t have one. The seemingly strong regulatory bodies that have stamped its authority on the healthcare sector over the last few years has shown it has vulnerabilities. A painful few months saw Johnson & Johnson, embroiled in a scandal over hip implants imported and sold by the company. They culminated in the publication of the report of an expert committee in August 2018. According to a report by LiveMint, the patients might get up to as much as Rs 1.2 crore each in compensation.Whether it’s a temporary set back or sea change remains to be seen, but alarm bells have gone off for several medical device manufacturers. Indian law is often considered weak when it comes to the rights of patients; leading to unfair clinical trials, the sale of faulty medical gadgets and the growth of medical tourism in the country. So, shouldn’t Indian authorities be also held accountable? “Absolutely,” says Shamnad Basheer, visiting professor of law, at National Law School, Bangalore. “Why is that that it took more than three years for the Central Drug Standard Control Organization (CDSCO) to cancel the import license when the global product recall had been issued in 2010 itself. That apart, the CDSCO should monitor the recall process and ensure compliance. Here, J&J claim that they cannot trace a large majority of patients fitted with the implants. How is this even possible? These are not OTC drugs selling at 10Rs. These are sophisticated implants administered to select patients by specialised doctors in big hospitals,” asks Basheer, who is also the founder of P-PIL, an initiative to promote public interest lawyering in India. What are the lessons that can be learned from J&J? “Our regulatory regime is in a mess. Had our regulators acted much sooner, we might have at least forced J&J to track all the implant patients and ensured that as many as possible were diagnosed and revisions surgeries are done, where necessary. Had our CBI stepped in when requested, we might have got more data points on which to nail J&J and make them fully liable. This might have also helped our criminal enforcement machinery,” explains Basheer. Each patient is different, and the losses suffered, and pain is likely to be very different. Which is why courts are best suited to work out damages in the long run. Around 4,700 ASR surgeries were carried out in India between 2004 and 2010, though only 1,080 patients have been traced through the ASR helpline. There are currently no specific legal provisions to provide compensation to patients. It all depends on the kind of case. “In some cases such as motor vehicles act (which is governed by a separate statute), the compensation claim is easy to make and get. However, the maximum amount recoverable under the statute is not enough. Which is why the new committee's efforts to look at the Moot Vehicles act while determining compensation for J&J victims is a bit of a joke!” explains Basheer. In the US, many states have strict liability statutes, where consumers can sue for defective products without even showing negligence. In India, under Consumer Protection Act, one has to prove negligence (failure to take due care in making the product) before one can claim damages that result from a defective product or service. 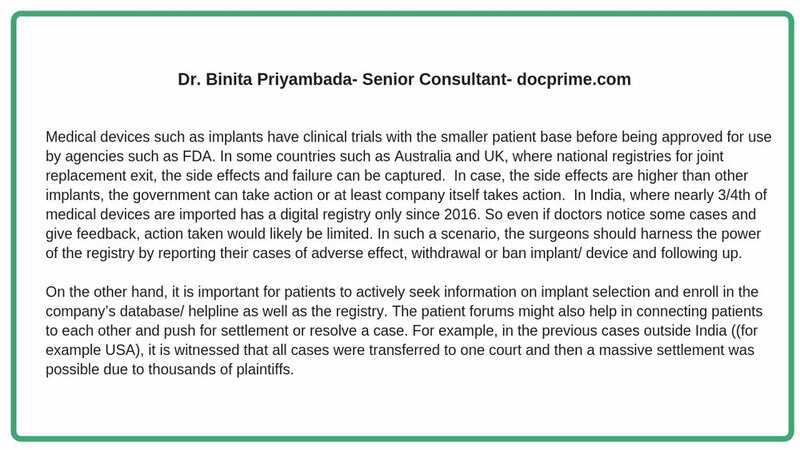 According to Nipun Goyal, co-founder of Curofy, a mobile platform to connect with other doctors, the entire issue with the J&J hip implant scam in India and the delay in recognising and rectifying the situation can be pinned down to 2 primary reasons; first, lack of expertise and oversight on implants at the CDSCO; and second, non-compliance by the CDSCO as well as the company of the regulatory standards for monitoring and reporting whether the implant is healthcare law compliant. “While the D & C Act and the rules/regulations framed thereunder provide regulatory powers to the CDSCO and DCGI to regulate and monitor the standards of implants, it appears that no heed is paid to this segment at all. The new lash out by the parliamentary panel on the CDSCO also demonstrates that there is no separate unit to take care of implant-related issues and the entire concentration vests in drug-related issues. The primary responsibility of the CDSCO and DGCI in letting the problem perpetrate cannot be ruled out. On the legal front, the burden of proof required to prove medical negligence is very high. Hence, it is that much difficult to get compensation for such negligence cases. Moreover, the present regulatory regime also does not provide for an adequate compensation dispensation system. This can be seen from the body of views in the J&J case which opine that such en-mass direction to pay compensation is not prescribed under the D&C Act and it has become possible at the behest of an expert committee specially set-up by the government to look into the mess. What’s all the Craze about Boutique Hospitals?